An automatic pool pressure cleaner can be great. One of the main advantages of this type of cleaner is they collect dirt and debris from the pool into a bag attached to the cleaner itself rather than straining it into the pool’s filter. As a result, less filter and pump maintenance is required. If your pool is subject to leaf fall from surrounding or nearby trees, or otherwise is in a location that causes a lot of debris, this is especially beneficial. That having been said, there can be issues with pool pressure cleaners. Our simple guide runs through some common problems to help you fix your pressure cleaner. To Booster Pump Or Not To Booster Pump, That Is The Question. Some pressure cleaners operate at relatively low water pressures of around 15-17 pounds per square inch (PSI), and are driven directly by the pool pump itself. Others operate at closer to 30 PSI, and therefore require an additional booster pump to generate sufficient pressure. Pressure cleaners that require booster pumps are costlier to install. They require, in addition to the booster pump itself, installing a dedicated poolsweep pressure line as well as a timer. Against that, they tend to be more efficient cleaners in so far as the booster pump provides an even and steady water pressure to the cleaner. Additionally, because of their timer, they don’t need automatically to run every time your main pool pump is running. The advantages of pressure cleaners that do not require booster pumps are that they are cheaper and easier to install. And they usually cost less to purchase. Against that, though, is the fact that they are less powerful than booster pump models, and tend to wear out sooner since they operate whenever the pool pump is running. Regardless of whether you pick a booster pump or non-booster pump model, the following are 7 common pool pressure cleaner problems together with, for each of them, a number of possible causes – most of which are easily remedied. Filter pump is not running. Whether or not your pressure cleaner requires a booster pump, the main filter pump needs to be running for the cleaner to operate. Booster pump is not operating. Check that the booster pump is on. If it is, disconnect the feed hose at the wall and check that water is being driven out at good pressure. Debris is jamming the cleaner. Solid debris such as sticks or stones can become wedged in the uptake part of the cleaner head. Check the cleaner head and clear out any solid debris. You’re using too much feed hose. Depending on your model, the length of the feed hose should be no longer than a sufficient length for your cleaner to reach to the farthest away part of the pool plus 0.9 metres. Models do vary in the recommended length of feeder hose – the Polaris 380 recommends the farthest away point plus 15 centimeters – so consult your owners’ manual. Your hose swivel isn’t swiveling. Many models come with swivels that connect the feed hose to the cleaner and also connect feed hose sections together. Make sure these swivels all turn freely, and also check that any flow arrows are pointing in the right direction – toward the cleaner. Your feeder hose has stubborn kinks in it. This can be the result of having been wound too tightly or having been left hanging on an outdoor hook during the off season. Rather than buy a new feeder hose, try laying it out in the sun for a day to warm up and expand. Your feed hose floats are incorrectly placed. Your feed hose floats are waterlogged. If the floats are in the correct position, but the feed hose is still sinking below the surface, you may need to replace your floats. You’re using too little feed hose. If the feed hose is too short, your pressure cleaner can cease to yurn and become stuck in one place. Your pool pressure cleaner’s wheels are too loose or too tight. Loose wheels can cause useless wheel spinning. Tight wheels, possibly the result of the wheels becoming jammed with debris or sand, can prevent the wheels from properly engaging with the drive systems. Inspect the wheels and make sure they are rotating properly and evenly. 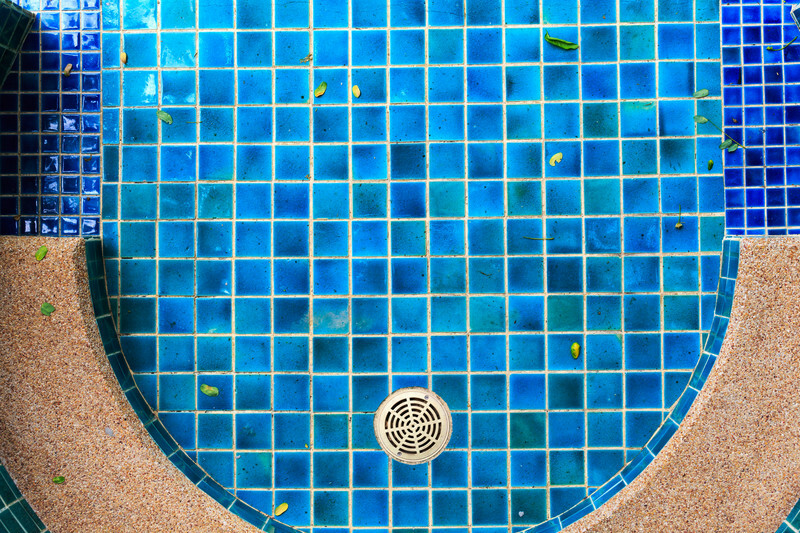 Your pool pressure cleaner is stuck behind the pool ladder or on the main drain of the pool. Ladders and drains are common pool pressure cleaner traps. To prevent this, invest in a ladder guard and/or a main drain cover. Your pool pressure cleaner’s back-up valve is malfunctioning. Most pool pressure cleaners have a back-up valve (also called a hydro-timer). Every three minutes or so the back-up valve is activated and reverses the water flow, thereby causing the cleaner head to be briefly lifted off the pool floor. The normal flow then kicks back on and the cleaner changes direction. The problem is that these back-up valves can become clogged with debris. They also sometimes fail and need to be replaced. To check if it is operating properly, clean out any accumulated sand or debris, and lift the unit out of the water while still running. If it is working properly, water will only squirt out of it once every three minutes or so. If, on the other hand, water is continuously being jetted out, it needs to be replaced. The inline strainer is blocked. Pressure cleaners have one, or sometimes two, inline strainers located either at the wall connector or in the feed hose itself. Disconnect the wall connector and check and clean the strainer(s). The water pressure in the feed hose is insufficient. Check the feed hose for holes or cracks that may be leaking water and thus reducing pressure. Also, if your wall connector includes a bleed-off valve, ensure it is not opened too far thus allowing too much pressure to escape. Your pressure cleaner’s water jets need to be adjusted. Pressure cleaners’ movement and cleaning pattern around your pool is dictated in part by water jets located, depending on the model, either on the cleaner head or the hose swivel. Adjusting these jets will alter the movement and cleaning pattern. For all their good points, most pressure cleaners, and especially older models and non-booster pump cleaners, aren’t designed to climb walls, steps or seats. You may have resort to more manual methods such as brushing to keep them clean. Pressure cleaners can’t handle everything, and older models have a relatively limited capacity when it comes to the size of debris they can handle without becoming blocked. Also, some pressure cleaner bags aren’t able to filter out fine dirt as effectively as suction cleaners.